Site C is a hydroelectric project in British Columbia that may soon to be cancelled. The commentary surrounding the Site C project has been driven by political posturing, and a recent change in government is therefore likely to end, at least temporarily suspend, the project. The situation is worth commenting on from afar because while it's B.C. today, in another time and other places some different - and many of the same - people will be discussing the merits of big, public, baseload power projects and small, private, sporadic power projects. Will there be a need for capacity? Will there be a need for energy? What are the costs and benefits of a Power Purchase Agreements (PPAs) with Independent Power Producers (IPPs)? Many of those claiming Site C won't be necessary comically follow that argument up with a list of alternative generation technologies. To evaluate the alternatives it is first necessary to determine the value Site C may provide. B.C. currently has adequate supply - it's peak "load" occurred early in 2017, and the province was a net exporter of power during that peak (as it is during most peaks). BC Hydro's resource planning anticipates the ability to meet the peaks to become less certain, and disappear around 2023. 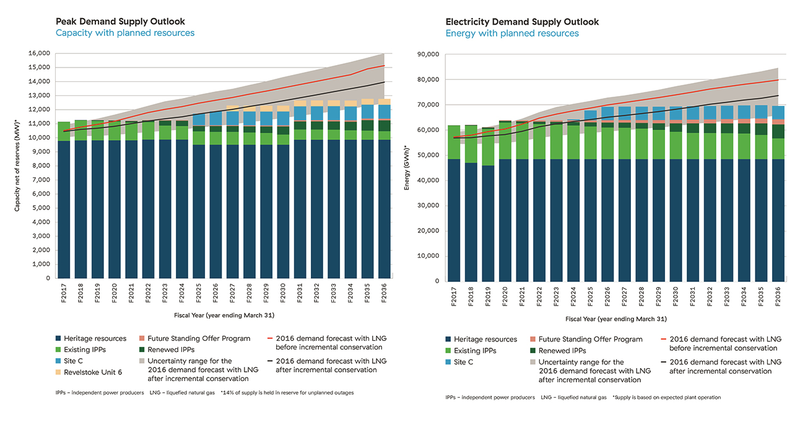 The need for additional annual energy is predicted to come later. The difference between the ability to meet peaks and the ability to provide enough energy throughout the year is important. There is a large difference between the contribution of Independent Power Producer's (IPP's) to annual energy, and meeting peak. This difference is helpful in demonstrating the comparatively large value of the reservoir hydro generators comprising BC's Heritage resources. 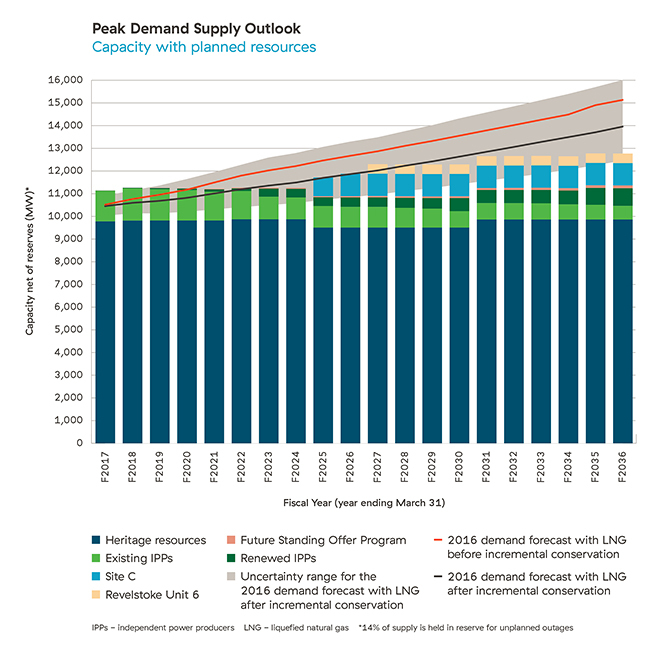 The identified peak demand capacity from "heritage resources" appears to be over 80% of the 11,869 MW hydroelectric capacity reported by BC Hydro - I'll refer to this figure as capacity value (a.k.a. capacity credit). The capacity value of supply from Independent Power Producers, as indicated by the share of annual energy production being much greater the capacity at peak demand, is obviously much lower. The implications of lower capacity values is quite clear in energy economics - the output from these generators is simply less valuable. Will contracts with independent power producers recognize the output is less valuable? Planners tend to over-estimate, simply because too little supply is seen as riskier than too much, so the need for capacity, and separately energy, aren't clear. I think the policy implications of increasing capacity are worth noting. A debate on the Jon McComb show had Harry Swain explaining Site C could be avoided, and Blair King arguing action to reduce emissions would benefit from it. I find both these positions defensible. What hasn't been explained with any coherence is why alternatives to an unnecessary project are constantly presented - but maybe everybody realizes the role of politics and, as it's recently been called, virtue signalling. Site C is a project initiated by B.C. 's Liberal party while in power back in 2010. The party lost power in 2017 to a combination of the NDP and Green parties. As is usual in our political system, the NDP developed a position opposing the government's project while in opposition, and would now find it difficult to reverse that position even without its practical need to appease the Green Party. There are likely already costs associated with the NDP's protracted reversal of the project. on August 2nd Premier Horgan "asked the British Columbia Utilities Commission (BCUC) to begin reviewing the Site C project,"
A difference of $610 million on a project that is to deliver 5.1 billion kilowatt-hours a year for a hundred years is not particularly impactful - but in the atmosphere this fall it could be fatal to the project. "Megaprojects" are under fire due to large price tags despite recent elections in B.C., and federally, sending balanced budget governments packing to embrace parties promising to run up debt. Site C has been projected to produce power at roughly the same cost as the Romaine projects in Quebec - which is overall a larger project yet is excluded from "megaproject' lists that dump Site C in with Newfoundland's latest Labrador hydro gamble. 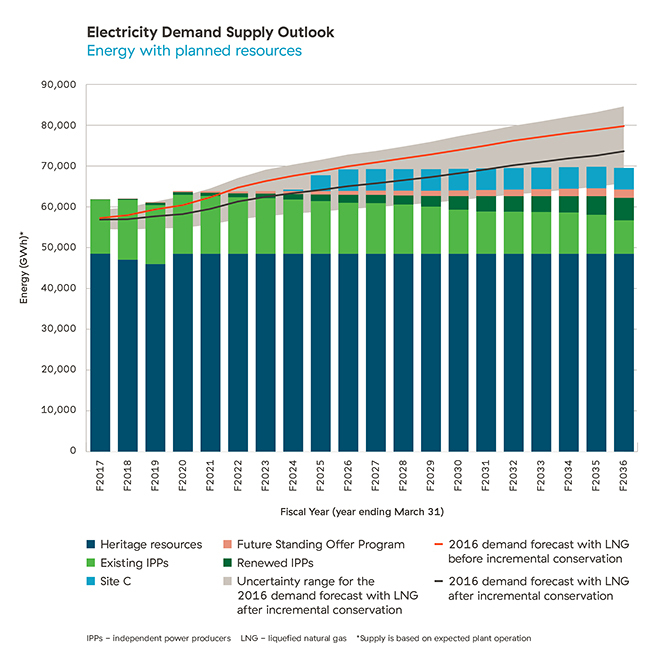 The NDP does have a sketch of a rational policy: increasing capacity at existing sites meets the capacity need, and with the flexibility of BC's reservoir storage, future energy needs might be met by other sources. A bigger question is how to recoup the value of updates to increase the capacity at public hydroelectric sites producing the same annual output if independent power producers (IPPs) are overpaid for low-value energy. There is a recipe for raiding the value of public power to enrich private producers, as Ontario has been doing just that for a decade. Terms like IPP mask the economic reality of the public-private decision. In Site C the public takes on the risk directly (presumably this would be passed on to ratepayers). Independent Power Producers generally require a power purchase agreement - which means the public pays an additional amount in return for another party assuming the financial risk. In the case of large public hydro, this generally means the public pays less for the far more valuable public generation than they do for frequently worthless output from the IPP generators, which are usually run-of-the-river hydro (where supply is unattached to demand) or industrial wind turbines. In July 2016 the Canadian Wind Energy Association posted a Pan-Canadian Wind Integration Study (PCWIS). CanWEA has also posted some data developed during the production of the study, which I've utilized to understand the figures recorded in the PCWIS. green dots are sites in a 20% Concentrated scenario (20CONC) in additon to 5BAU. red dots are sites in a scenario targeting 35% of Canadian electricity coming from wind (all other dots in BC are also in that scenario). Remember this is a study largely produced by industrial wind turbine manufacturer GE, and distributed by the Canadian Wind Energy Association, as you note no scenario has locations on Vancouver island aside from the site already there (Cape Scott) - nor any close to the major population centre of Vancouver. Not mapped, but notable, in the scenario to produce 5% of Canada's electricity from wind only 3.1% is produced in BC. In the 20% CONC (concentrated) scenario only 11.5% of BC's load is serviced by BC's wind. Returning to capacity valuation, the PCWIS has a complex method of estimating the figure for each province. Sites are selected, ideal modern turbines are assumed on each (including existing sites), other generators are identified, as are connections to other grids, and demand, and scenarios run to measure how much demand could be increased when wind generation is added before load servicing requirements fail. I can't recreate that, but I don't have to. I've matched hourly PCWIS data to BC load data (adjusting for time zones), and calculated how much load must be met by other sources. Breaking the requirement down from one day of outage every 10 years to not matching demand 2.4 hours per year, I've selected the 3rd highest residual load hour for each of the 3 years (after subtracting wind output in each scenario). My figures are not as optimistic as the PCWIS's. All those figures don't provide the clarity many want, but all willing to understand should recognize the capacity value for industrial wind turbines falls between nil and not much. Wind is not an alternative to Site C for provision of capacity, but wind does provide energy - meaning when the wind is productive reservoirs are not lowered. Remembering Site C was to be useful in meeting capacity needs prior to energy requirements, some, including BC "Green" Andrew Weaver,have turned to chatting up pumped storage. The Times Colonist ran an entire article by Vicky Husband promoting the technology - as if it didn't flood any areas. If nothing else pumped storage should clarify the distinction between capacity resources, to meet peak demands, and energy resources: pumped storage is not an energy producer - it is an energy consumer (as it is not 100% efficient) - but a capacity provider. The article speaks to a report "identifying nearly 200 candidate sites for pumped storage on Vancouver Island and the Lower Mainland alone." Why - when energy producers would be built far from these sites? To put this together: if one did want to grow wind in B.C. the richest resouce is near the Peace river location of Site C. Romaine isn't the only thing being ignored in Quebec - the integration of wind into a largely reservoir-based hydro system is also being ignored. There are always arguments against adding new generation projects and they are usually built on a firm foundation. Planners do tend to overplan - which is a type of survival mechanism and risk management technique. The BC Liberals’ strategy is fixated on LNG plants that employ very few people when operational, and the unnecessary and destructive Site C project. Their outdated, enthrallment with gigantic, environmentally damaging projects is breath-taking. Environmentally damaging projects like Site C are what give Manitoba and Quebec very low rates, and run most of B.C. without producing any air pollution - and at moderate costs. Perhaps most people haven't noticed the carnage because their inferior to Green party members. Maybe opposing large hydro and embracing fringe technologies is only empty virtue signalling. The Green's "Climate Action Strategy" appendix to their election platform promised money to academics like Weaver, higher road tolls elsewhere, reprogramming of citizens for lower energy use and, of course, higher carbon taxes. As somebody who looks at data and sees repeated evidence that low-emission baseload supply is the only proven path to very low emissions from generating electricity, I do not consider the abstract thoughts of Green party platforms virtuous. Political circumstances in BC may well kill the Site C project. That should disappoint optimists for a lower emissions future, and particularly those hoping for more co-operation among provinces in lowering emissions: the site is much closer to Edmonton than it is to Vancouver, and Alberta has more emissions to displace. A bigger concern within BC may be those looking to sign unnecessary power purchase agreements with Independent Power Producers as an alternative to the unnecessary. 1. Capacity factor is simply the production from a generator over a period of time divided by the theoretical output if the generator produced at 100% of nameplate capacity throughout the period. 2. These quick calculations are made using a B.C. hydroelectric capacity of 12,942 MW from Table 4.2 of the Pan-Canadian Wind Integration Study (PCWIS) and the average 2011-2015 annual "Hydraulic turbine" generation from CANSIM Table 127-0002. 3. I wrote on the study at the time as its release coincided with a critique I wrote of a Wind-Water-Sun fantasy by an American celebrity. Subsequent criticisms, and revisions, to that celebrity's work confirmed my criticism which focused on the failure meet capacity requirement necessary to reliably supplying power all the time. On the other hand, the average wind production pattern, according to the PCWIS data, shows strong output October - January. That supports an interpretation of BC wind as a good energy provider in a system that does have sufficient capacity resources.